Al Nayzak for Supportive Education and Scientific Innovation was established with a vision to create and foster a culture of scientific innovation and creativity in our Palestinian community. Grounded in the ideology we have adopted since our foundation, we have continued to introduce to the Palestinian society to programs and initiatives in the fields of science and technology education, critical and logical thinking, scientific and technological entrepreneurship, and systematic social change built upon the principles of scientific research. In realizing our vision, we have adopted a series of annually conducted programs which incubate Palestinian talent and innovation from an early age until it reaches a point where it fully realizes its scientific potential and produces efficient scientific and technological innovations. In accordance with our vision to create an accessible platform of scientific knowledge and nurture a generation of innovative critical thinkers that employ scientific and practical learning in their lives, we established Palestine’s first Science and Technology House: a unique and creative space that provides our society with interactive scientific and technological knowledge. Located in the old city of Birzeit, the Science and Technology House presents itself as a dynamic and vibrant space where our visitors are introduced to the latest phenomena and advancements in the fields of science, technology, and engineering. The value of the Science House stems from the grounding objectives around which its activities operate. Perhaps the most important objective of the Science House is to develop Palestinian awareness of science and technology, particularly among school students. In doing so, the Science House acts as a space serving conceptual and practical knowledge that is complementary to Palestinian scientific and technological curriculum. Receiving close to 15,000 visitors annually, the Science House caters to a wide range of Palestinians from numerous regions and of all ages. Schools all over the West Bank and Jerusalem organize visits to the Science House throughout the year, and are introduced by our experienced staff to a distinctive interactive experience that familiarizes them with a variety of scientific concepts. The Science House aspires to provide essential tools to stimulate science and technology education and raise the level of interest in the community. Exhibits standing in the Science House were curated by our expert science staff to highlight the relationship between science and our daily lives. From our Telecommunication exhibit to our Robotics Laboratory and our Scientific Garden, the Science House experience reflects a process of active engagement and creative knowledge acquisition that is particularly unique in our society. The Telecommunication section of the Science House engages with our visitors’ curiosity of the scientific and technological process behind telecommunication. Inquiries tackled range in scope from the practical application of basic elements of communication to the electromagnetic radiation that is used in transmitting calls and information. Adjacent to the Telecommunication section, we have the Chemistry and Medicine section where visitors are familiarized with the process of manufacturing medicine in Palestine, through following its scientific and technical stages. Another exciting section in our Science House is the Robotics Laboratory, a space equipped with advanced tools and instruments that create an interactive experience for our visitors to engage with robotics, electronics, and electricity. Residing on the roof of the Science House, is our Physics and Astronomy section. There, visitors explore all that is related to aviation, space exploration, and much more. In our Astronomical Observatory, visitors observe sunspots during the day and stars and planets in the evening using modern and advanced telescopes. Surrounding the Science House is our scientific garden, a space that embodies the concept of learning through play and promotes scientific learning and engagement through lively activity. While much of the Science House’s activities cater to school children, our vision to promote scientific knowledge and innovation demands that we work on raising the capacities of human resources working in the field of scientific education and increase its proficiency. To do so, our staff often designs specialized professional courses targeting university students, teachers, and staff of different organizations and companies. Such courses provide in-depth knowledge and analysis on a variety of scientific and technological topics, while simultaneously promoting the Science House as a space designed to support individuals of all ages and of all backgrounds. In overcoming the geographical, logistical, and financial obstacles imposed by the Palestinian reality, we have created an interactive and accessible space, gathering scientific and technological concepts under one roof. 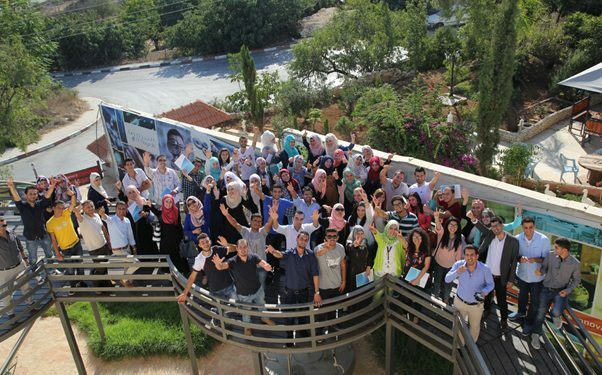 Al Nayzak envisions an innovative Palestinian society capable of producing original scientific knowledge integrated with sustainable development. In our path to realizing this vision, the Science and Technology House proves a vital achievement which will continue to promote scientific and technological values and enrich our Palestinian society with a space of creativity, intrigue, and innovation.